Did you just get that special tattoo that you’ve always wanted? It looks great now, but how can you keep it bright and bold for many years to come? While some fading over time is natural and to be expected, it can be devastating to experience premature fading of beautiful tattoo work due to neglect during the sunny months. Proper summer care for your tattoo is crucial, especially in the first few months. Even if your tattoo is in a discrete spot and covered by clothing, it’s still at risk for fading, color spreading, and scarring due to sneaky UV rays. Thankfully, there are some easy options to care for your tattoos that can just become a part of your daily grooming regimen. Even if you have sensitive skin – not to worry, we have all the tricks you need right here. – Using sunblock without saying. Once the tattoo is healed, apply a spf 30 or higher sunblock liberally to the entire tattoo every time you go out during the summer, and especially if you will be spending lots of time in direct sunlight – like on the beach. It’s especially crucial to put sunblock on your tattoo after it is healed during the first month (generally 10-14 days after you get it). 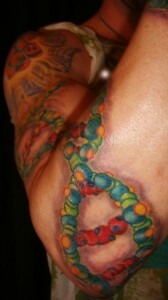 This is when your tattoo is in it’s delicate healing stage, and very vulnerable to outside elements. Recommended sunblocks to use are Coppertone Waterbabies , Coppertone Sport , and Bull Frog . A good trick is to take a chap stick containing sunblock around with you, so that you can easily outline and cover your tattoo with the chap stick any time. Even better is to outline the tattoo with the chap stick, then also fill it in with a sunblock. This works great for larger tattoos. Just make sure to re-apply every 2-3 hours, or if your skin gets wet. Obviously, don’t apply sunblock, chap stick or anything else that may contain petroleum when your tattoo is still scabby. When used at that time, products containing petroleum will clog your pores, hinder the healing process, and possibly draw out ink. If your tattoo is that fresh, it’s best to just keep it covered and away from the elements. Do your very best not to expose your new tattoo to direct sunlight for up to 1 month after getting it, and especially during that 14 day period. Sunlight will burn the delicate skin and cause fading. Despite the fact that it may be tempting to show off your new tattoo right away, you should wait at least 10-14 days until you let it get in contact with direct sunlight. Again, if your tattoo is less than 4 weeks old, don’t expose it to the sun at all if you can. It’s best to keep it covered and away from the sun. It is annoying, but in the long run it’s best to make sure every bit of color stays just as bright as it should, as UV rays can penetrate and bleach the tattoo and cause darker colors to spread. Maybe even worse is the fact that your delicate skin will burn more easily and is at a higher risk for scarring from sun damage during this stage. Not to mention upping your risk of melanoma and other not nice things. Try to stay out of pools, bathtubs/hot tubs, the ocean, etc. Any kind of prolonged soaking, abrasive or chemical filled water situation should be avoided at all costs during your 14 day healing period. This will tamper with the healing process and potentially can damage the work you just paid for. When bathing, take light showers while trying to not to let the water run directly over the tattoo, and certainly don’t scrub the area. If you are on vacation and are tempted to celebrate with a new tattoo, plan to get it during the later half of your trip. That way you won’t be tempted to forgo any of the proper care instructions or miss out on any of the fun stuff you want to do. It can be fun to commemorate a trip with a new tattoo, but it’s important to make sure you investigate the place you are going to and make sure they have quality work and use safe measures. You are making a permanent investment on your body, and a place that is far away from you may not be able to or willing to do touchups if you find that it doesn’t meet your expectations or their work was not of quality. And always, listen to your artist – If he or she has any specific instructions for your healing period, make sure you follow them completely. They have your best interests in mind.